Guaranteed Scorpions Eliminated or YOUR MONEY BACK! Exterminating scorpions in Arizona involves a great knowledge of the creatures instincts and natural habitat. 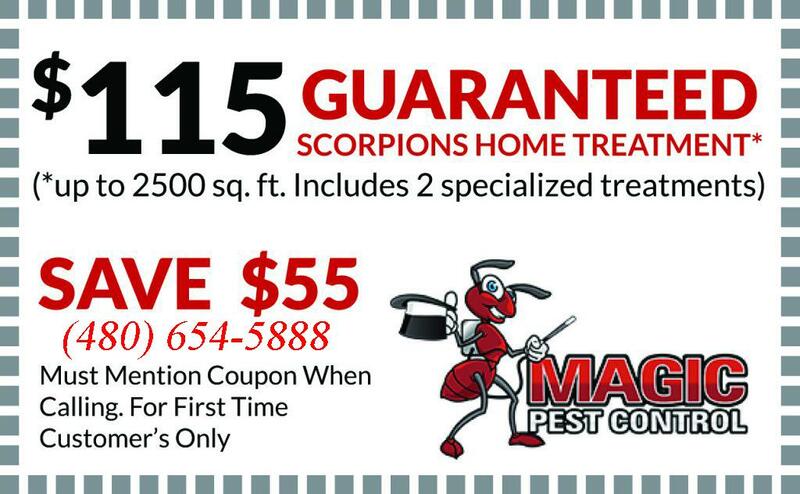 Magic Pest Control specialists are trained in all aspects of scorpion behavior and Arizona scorpion control technique used to infiltrate, exterminate and control scorpion nests and their food source. Home Sealing – Magic Pest Control caulks and seals all vulnerable areas around your home or business structure and window seals. It is imperative that your home is sealed properly, as these little critters can come through a crack as thin as your credit card! Scorpion Control is most effective with the combination of home sealing and regular pest control treatments around your home or business structure. Food is the scorpions prime motive. Since they are nocturnal they forage at night. They feed off all types of insects, pests and even mice at times. Scorpions have organs and hairs on their legs that detect sensitive vibration. This is how they catch their food. Because scorpions are predators they tend to return to the same area each night to hunt. They can withstand starvation for 4-5 months. If you control the scorpions food source, you control the scorpions. Scorpions are excellent at climbing but can’t climb glass. If your home is infested, put the scorpions in clean wide-mouthed jars. Make sure to pull all furniture away from walls and shake clothing before putting it on. Scorpions like to cling onto loose objects. Scorpions are blind to ultraviolet light and it makes them glow! At night time equip yourself with a black light and scorpion killer (or tweezers and a glass jar if you want to collect them). Routinely mow grass and keep an 18″ vegetative free perimeter around your home. Remove or clean any harborage. Use caulking and weather strip to seal up your home and its windows. Repair plumbing leaks and ventilate in areas where precipitation occurs. Make sure to get regular pesticide treatments! If you control the scorpions food you can control the scorpions. Scorpions have been around ever since the Paleozoic times, aging them over 400 million years old. However, still to this day they are known for their painful stings and scary appearance. Just in the last few hundred years have scientist developed an understanding of their role in the desert ecosystem. Scorpions are venomous arthropods in the class Arachnida, relatives of spiders, solpugids, pseudoscorpions, mites, ticks, etc. They have eight legs, a long tail and a pair of pedipalps for capturing prey. At the end of the tail they are equipped with a stinger, fully loaded by a venom producing gland. There are over 1400 species recognized today ranging from locations all over the globe. Most scorpions are adapted to live in deserts such as the Mohave, Sahara and Kalahari. A smaller percentage lives among the rainforests of Asia and Africa. Regardless of where the scorpion resides they key to their existence is all the same, the skilled art of an ambush predator. Many enthusiasts, scientists and invertebrate dealers (especially in Arizona) use a common, universal and easy to understand tool that classifies the venom of scorpions. It is a simple numerical scale of 1-5 as shown below. All scorpions found in the United States fall at or below level 3. The Arizona bark scorpion Centruroides exilicauda is the highest the country has at level 3. However, in many states including Arizona, level 4 and 5 scorpions are legal for possession. These scorpions include yellow fat-tails, black fat-tails, death stalkers, and many others. They are extremely aggressive and will immediately posture in strike position upon irritation. Remember, one sting from a level 5 scorpion can and will most likely be fatal! 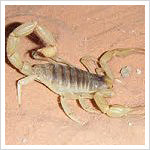 Arizona bark scorpions Centruroides exilicauda are the most abundant and heavily encountered. They are also the most dangerous in the country. Small in girth, they have the ability to reach 3 inches in length and move very fast. They range all around the Phoenix area and in the majority of the state. They are one of the few species of scorpion that often climb the stucco walls of buildings and homes. This is a tactic they use for hunting small insects at night. Bark scorpions have a bad reputation with humans. There are many common scenarios that happen repeatedly which are easy to avoid. Most of them involve someone walking through the house at night or their neighbor cleaning up that pile of wood that’s been sitting out back for a year. Bark scorpions are particularly nervous creatures that strike first then run away after you’re jumping up in down in agony. So it’s best to plug in the old noggin and pay better attention next time you are fishing your hands around something. Known for its voluptuous size and respectable length the Desert Hairy scorpion Hadrurus arizonensis is the largest found in United States. Adult size can scale to 4 sometimes 5 inches. Ranging throughout many low land areas where sand is abundant and around populated locations as well. As a whole this species is not too hard to find. However, due to their shy demeanor finding one generally requires a little searching. Desert Harries prefer hiding during the day under rocks and other obstructions as they are nocturnal. Once darkness falls activity will spike as they venture out to feed. Unlike pesky bark scorpions that are commonly found on building walls of residential areas Hairy scorpions prefer to stay low to the ground and out of the way. Their role around our living areas should be valued due to their veracious appetites. They will literally attempt to eat any living creature their size or smaller including the not so innocent bark scorpion. Normal diet involves spiders, centipedes, small vertebrates, scorpions, crickets, and many others. For two reasons the venom associated with this species is quite harmless to humans. First, given that whomever is stung is not allergic, the sting from a Desert Hairy is similar to that of a bee’s and is quite harmless. A mild but irritating reaction with swelling can be expected. All Desert Hairy scorpions are considered to be a level 1 on the venom scale. Second, they are not commonly found in most housing communities and typically have specific localities they prefer to reside in. The Pale Desert Hairy Hadrurus arizonensis pallidus is a type of color morph to the Standard Desert Hairy scorpion Hadrurus arizonensis. They appear nearly identical except for in color and translucency. Color typically ranges from a slight pale yellow to a bright beach sand yellow and can be easily singled out from the regular Desert Hairy scorpion. The venom from their sting is relatively mild same as an Arizona Desert Hairy. If stung, normally a bee sting-like reaction with mild swelling and redness can be expected. While all true scorpions are potentially dangerous this species is typically not found to be aggressive like many of its relatives. All Desert Hairy scorpions are considered a level 1 on the venom scale. The Stripe Tailed scorpion though small in size, can pack one punch of a sting. Typically all small scorpions should be known for this trait. Only averaging around 2 inches in length this species is distinctly different from bark scorpions. Their bodies are substantially thicker with distinct lines that run up the length of the tails. They are burrowers that typically dig up to a meter deep in fine gravel/soil mix. Generally, encounters with this species are slim unless living in a residence close to mountainous, rocky or desert landscape environments. The Vinegaroon is a true sheep in wolf’s clothing. These gentle giants are harmless only emitting the potent smell of vinegar when distressed. Also called Whip Scorpions from the skinny tail they use to do it with. Many of times mistaken as scorpions these arachnids are squished and stomped for no reason. However, they are more a friend to humans for eating up the pesky insects that get in the house. Like a scorpion they have eight legs. Two of which are modified for sensory. Vinegaroons also use pedipalps as a means for catching prey. They are heavy burrowers and are only seen out at night. Due to their calm disposition they make wonderful pets for any bug enthusiast. In Arizona, scorpion stings are quite commonplace. Many times, when walking in the dark at night, Arizona residents are not even aware that a scorpion might be under-foot or nearby. In most situations, a scorpion sting is nothing to rush to the emergency room about, unless the sting occurred to a small child or an elderly relative. And while many Arizona scorpions do not carry enough venom to seriously injure, it’s the bark scorpion that you have to worry about. Young kids who have been stung by a bark scorpion should look for signs of intensified pain but with no signs of swelling or redness. Muscle twitching, uncontrollable crying, excessive drooling and/or sweating are also associated with a bark scorpion sting. Finally, if your child exhibits unusual eye, head or neck movements this may be a reaction to the sting. Should an adult fall victim to a bark scorpion sting, they will exhibit signs of rapid breathing and high blood pressure, as well as muscle twitching and weakness. It’s best to see a doctor immediately if you suspect your child or grandparent has been stung by any type of scorpion, especially a bark scorpion. It’s much better to be safe rather than sorry in these types of situations. If you or your child is ever stung by an Arizona Bark Scorpion, the best thing to do first is it to immediately call the Poison Control Center of Phoenix. Their number is 1-800-222-1222. The Poison Control Center of Phoenix will know the questions to ask to determine if this is a life-threatening situation. If you’re not sure of the signs and symptoms, and not sure about the type of scorpion that you or your family member were stung by, give them a call. If the symptoms are severe, obviously forgo the phone call for a visit to the doctor or emergency room. Reminder: Arizona Bark Scorpions are the most dangerous scorpions in the United States. Arizona Bark Scorpion stings symptoms can be some of the worst. Don’t underestimate the damage that one sting can do!